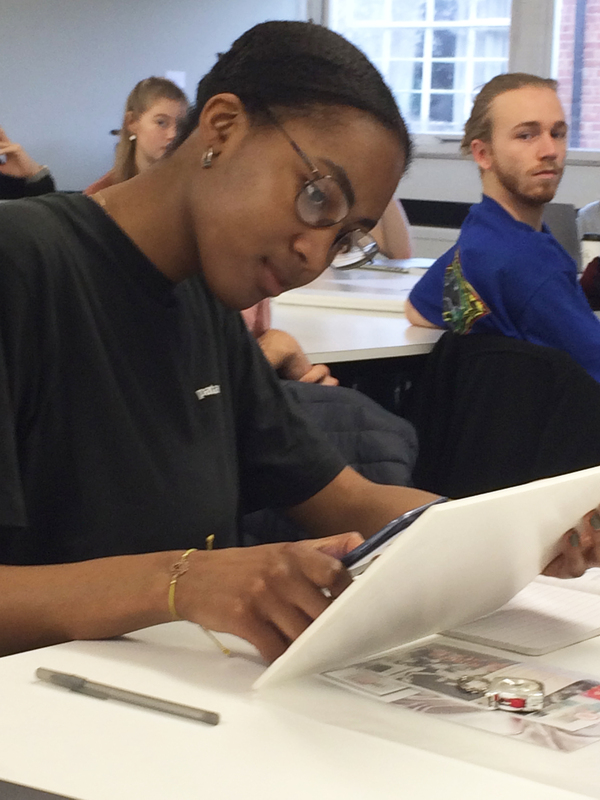 Today’s Breaking down Barriers workshops in Typography provided students with opportunities to explore a range of applications for inclusive design, from printed designs to wearable technologies. Part 2 student Malaika Johnson exploring the role of assistive technologies in inclusive design. Prof. Rachel McCrindle from Biomedical Engineering joined Information Design lecturer, Dr Jeanne-Louise Moys and the Part 2 Graphic Communication students. Rachel and Jeanne-Louise are part of a team of cross-disciplinary researchers exploring how the lives of people with aphasia (who may be undergoing rehabilitation following a brain injury) or dementia can be improved through assistive technologies. In a hands-on workshop, students explored an exciting variety of assistive technologies that we are developing and researching to help make a difference to people’s daily lives and their experiences of rehabilitation activities like cueing therapy. 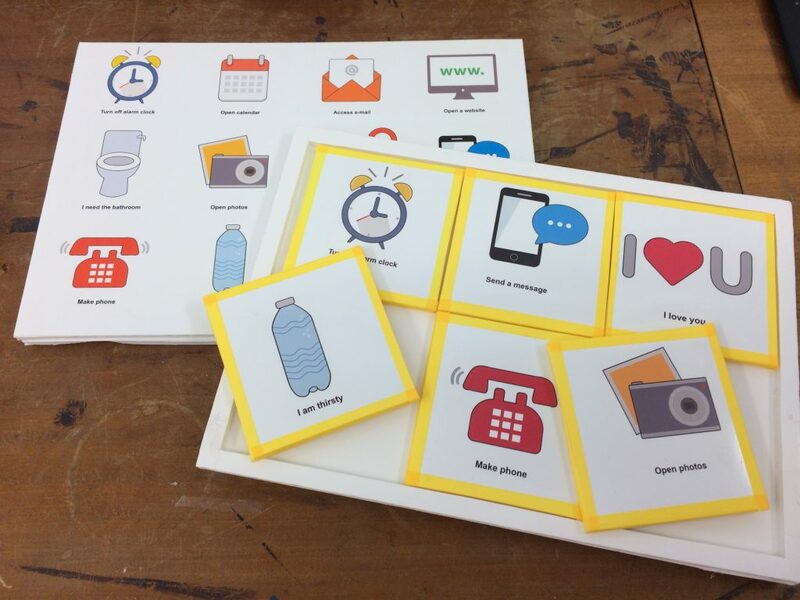 In particular, cueing therapy resources that Graphic Communication student Carmen Martínez-Freile developed last summer as part of an undergraduate research opportunity (led by Jeanne-Louise, Rachel and other colleagues in Speech and Language Therapy) highlighted the role Graphic Communication can play in assistive technologies and inclusive design. These cueing therapy resources were developed for our cross-disciplinary research project. Using illustrations prepared by student Carmen Martínez-Freile, we explored how different illustration styles influence people’s experience of cueing therapy resources. Carmen’s resources were not the only Graphic Communication student-created resources incorporated into today’s workshops. We also used a worksheet developed by Typography student Jessie Webb to support visual acuity activities. In today’s activity, students evaluated whether particular typographic, colour and physicality attributes can be considered visually inclusive across a variety of genres, including brochures, business cards, receipts, forms and even the new Guardian newspaper redesign (just launched in the UK today). Jeanne-Louise said she particularly enjoyed how today’s workshops demonstrated clear synergies between research and practice, while providing students with an opportunity to consider how graphic design can contribute to society beyond the ‘usual suspects’ like awareness campaigns. She hopes these workshops will inspire some students to explore inclusive design further in their final year dissertations and self-directed projects. 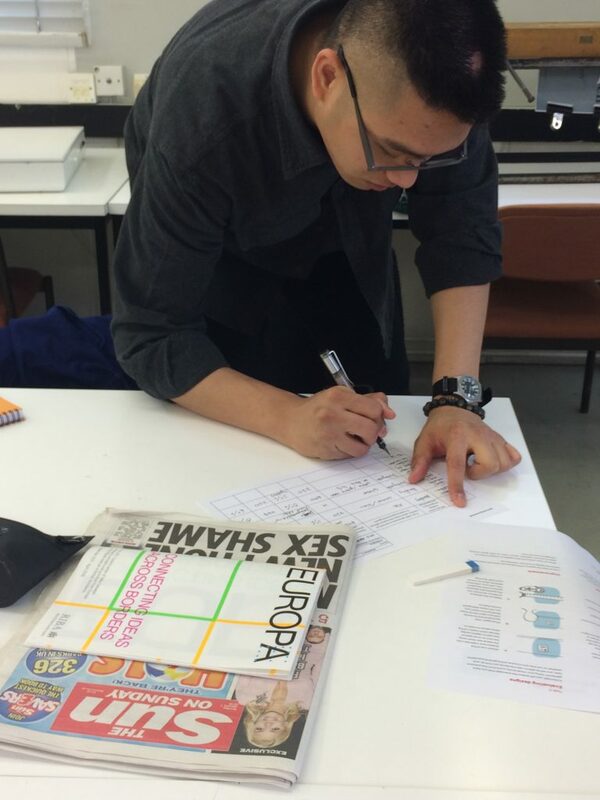 Typography student Siu-Yen Lo evaluating whether printed designs are visually inclusive, using learning resources created by other students in Typography.